The Lockheed P-80 "Shooting Star" was designed as the Lockheed XP-80 by a team of 28 engineers led by Clarence "Kelly" Johnson, it first flew on the 10th of June 1944, just 143 days after initial design work started, it was the first design to leave the drawing boards of what was later to become known as Lockheed's famous "Skunk Works". On the 19th of June 1947 a specially prepared P-80 set a new world speed record of 623.8 mph piloted by Colonel Albert Boyd and one year later was re-named the F-80 (the P was for pursuit and the F for fighter). The Lockheed P-80 Shooting Star was built around the de Havilland H1 B turbojet engine which had been designed for the prototype British de Havilland Vampire jet fighter, and in 1945 became the first operational jet fighter of the United States Army Air Force, unfortunately it was destined to also become the first jet fighter type to be grounded by the the United States Army Air Force, this was in response to a series of crashes resulting in fatalities to several of it's test pilots due to engine related problems following the change to the new American GE I-40 turbojet. The Grounding of the Shooting Star resulted in it never seeing combat during WW2, but it did see combat in the Korean War becoming the victor in the first ever dog fight between jet two jet fighters, a P-80 Shooting Star and a MiG-15. Despite claiming first blood it soon became apparent that as a fighter the Shooting Star was at a disadvantage to the Russian swept wing MiG-15, consequently the P-80's were replaced with the F-86 Sabre which utilised swept wings based on the WW2 German jet fighter the Me 262. When the last Shooting Star jet fighter rolled off the production line in 1950 a total of 1,715 aircraft had been produced, however a lengthened twin seat training version, the T-33 or "T-bird" remained in production until 1959 and was also made under license in Japan and Canada, a total of nearly 7,000 being produced. 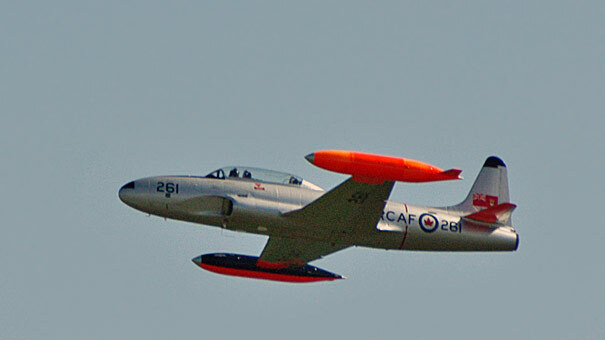 The picture above depicts a late Canadian built T-33 trainer. This picture of Lockheed P-80 Shooting Star is Copyright © June 2014 Siteseen Ltd. We only authorise non-commercial picture use and particularly encourage their use for educational purposes. This Lockheed P-80 Shooting Star picture is not in the Public Domain.